Anyone worried about Firefox's penchant for leaving a massive memory footprint when it makes the move to mobile can breathe a little bit easier. 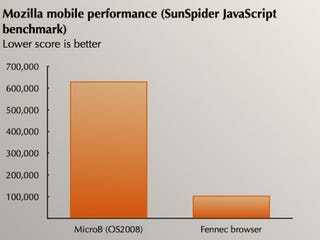 The hard optimization tweaks made during Firefox 3's development cycle have paid off: Benchmarks on Nokia's N810 show that the latest Mobile Firefox build is six times faster than the built-in browser, which is actually based on a Firefox 3 alpha. But the coolest stuff is yet to come.